That the gaps grow progressively bigger scanning down the afternoon rankings tells the story of this key stage of Leg 3 of La Solitaire du Figaro-Eric Bompard cachemire. As the leaders work progressively south and west towards the Odas turning mark, some 61 miles ahead of Yann Eliès’ bow, they were the first to break into better breeze. Initially it appears to have been the thermal W’ly – not shown on the forecasts – but it was enough to get Eliès and the three leaders moving at five to six knots while the second and third ranks, only a matter of half a mile to two miles behind, were still all but stationary. For the likes of Britain’s Sam Goodchild and young rookie Richard Mason it has been a painful day, a reminder perhaps of how the very good – like double winner Eliès – seemingly make their luck. Less than 24 hours ago as they rounded the SW corner of Belle Isle, Goodchild was in the hunt along with Eliès and Gildas Mahé. The island which lies 14kms off the Breton coast was a British stronghold once, before it was returned to the French in 1763 in exchange for the island of Minorca. 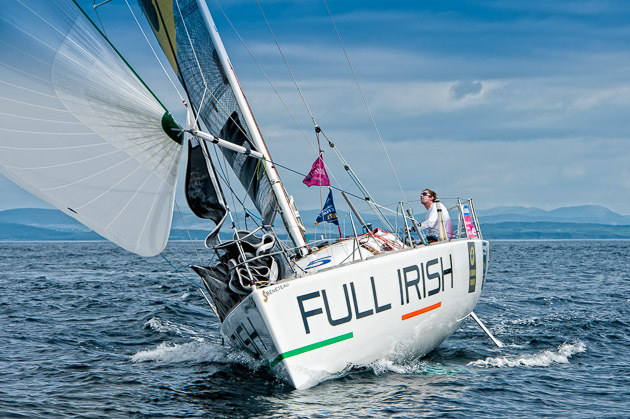 And for all that Goodchild was staking a claim to the lead in glassy smooth conditions more akin to Mediterranean Minorca to Atlantic Morbihan, it was the double Solitaire du Figaro champion who eased away. 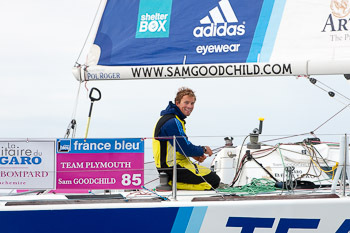 Goodchild, speaking to Race HQ in Les Sables d’Olonne this morning, explained how he had seemingly struggled to match their straight line speed, and half a mile became one mile became 10 miles. And on the 1500hrs local time ranking Team Plymouth was down to 19th, over 15 miles behind Groupe Queguiner Leucemie Espoir. For young rookie Mason on Artemis 77 the experience of being up at fifth just after sun rise this morning, 1.9 miles off the lead is one to be treasured but the slide into the pack – stuck in the east and missing out on the first of the W’ly then NW’ly – has been painful. 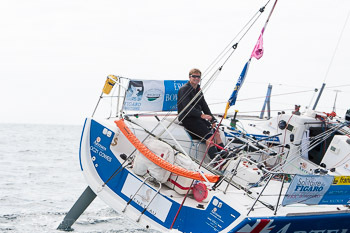 And while the moods on the water may be bleak despite the fierce summer sunshine, it was a very disappointed Fabien Delahaye who arrived on Skipper Macif 3 into Les Sables d’Olonne. The erstwhile race leader, who will celebrate his 30th birthday just after the race finishes and who finished runner up in 2010, retired from Leg 3 after his D1 shroud failed pre-start on Sunday. He had decided that his deficit of more than 30 miles was too much to make up and so retired last night and headed for the Leg 3 finish town where he arrived in Port Olonna this morning. But for the 35 remaining soloists there is still half of the 505 miles leg to sail, 60 or so miles to the turn and then 140 miles back nearly due east towards the BXA mark off the Gironde estuary before a final climb 55 miles north to Les Sables d’Olonne. Several of the solo skippers today spoke of conserving water and the possibility of a fourth night at sea. The NW’ly breeze is forecast to stay through tonight which should allow more regular progress to continue down to the turn. But another slow down may happen with the breeze slackening to four to seven knots. And then tomorrow the wind will be WNW which should present a reasonable reach across towards the final turning mark, accelerating in the afternoon tomorrow with a one sided beat up to the finish. Better conditions are forecast for the finish of this third leg. A low over Brittany should provide the skippers with a 15 knot WNW’ly wind to make their way to Les Sables.